Hey everyone - Just to preface, all organization for this tournament will be over at the subreddit. You can see posts on the sticky at the top. This epic showdown will be sponsored and promoted by Torn Banner Studios. So don’t forget to check the community Brabble. Also keep an eye out for the MOTD on official servers! Prize Money: Current pool at $2000+. All money (after the exchange charges of the service we end up using) will go towards the players, and the top 6 teams all receiving a cut. _Sponsored by: Torn Banner Studios and the ChivNA team. 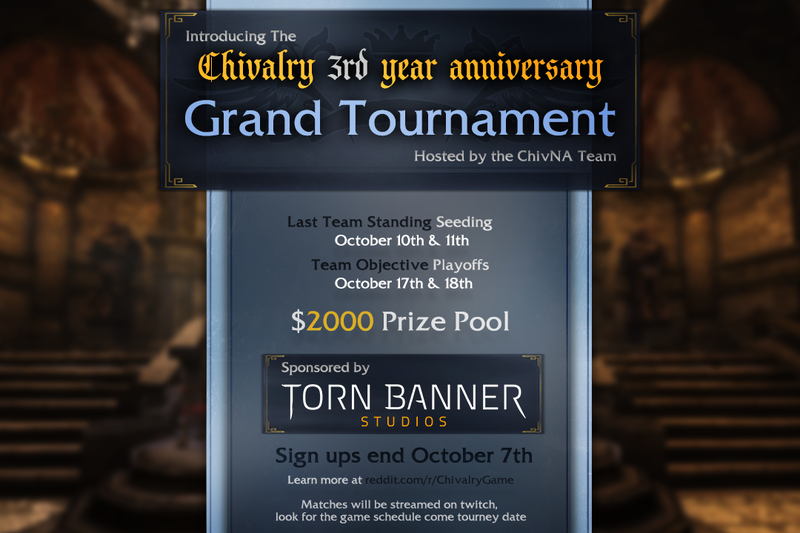 Chivalry 3rd Year Anniversary Grand Tournament Goes Live at 12:01PM EST - GET HYPE! Commentators are very good, its exciting to watch two closely matched teams. Pity it wasn’t pinned on the Steam hub originally as I suggested many times imo. 3 year anniv’s don’t come about every day. I suppopse its to late to sign up as a free agent. I hope you guys post full videos!